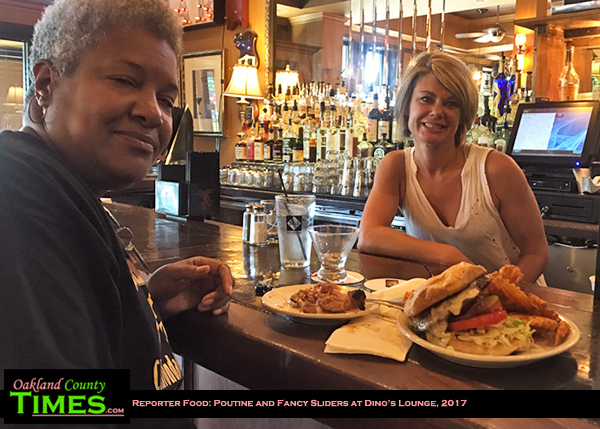 Ferndale, MI – Some exciting changes are coming to Dino’s Lounge and I was lucky enough to have lunch with entrepreneur extraordinaire Dean Bach the other day to hear all about his big plans. Dino’s Lounge and M-Brew are about to have a sister restaurant added to the Dino’s Family. A new restaurant is soon to be announced, somewhere north of his two Downtown Ferndale locations. More info will come later in the fall on that. Dino’s Lounge is due for some changes, and Bach is super excited. The “upscale but not uptight” atmosphere will be cooled even further, with the warm mustard-colored walls painted a relaxing newsprint gray. All the wood – the tables, trim, bar etc – will be refinished or replaced. And the years of memories that currently feel eclectic on the will be replaced. No more wall of blue plastic pig head awards or decade-old thank you notes. There is a new round of memories to be made. Perhaps the most exciting change will be the addition of large glass doors that will scroll back like garage doors, opening the restaurant up to the fresh air and fun views of the people and cars of Woodward Avenue. And then there is the food. This month’s specials give hints of the menu to come. Poutine, wings and sliders. Those are the themes – with six varieties of each being tested. 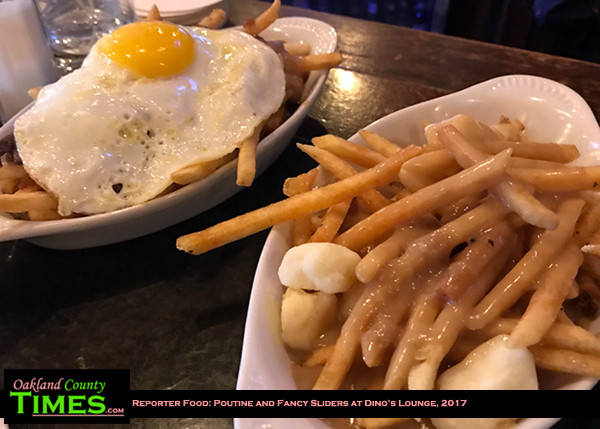 I had Montreal Poutine, which is made the traditional way with mozzarella curds and gravy. There is also a carbonara style with gravy, bacon and a sunny egg. Other varieties are Coney DeTwa, BBQ Picnic, Bangers and Mash and Vegan Veggie which has sautéed vegetables, tofu and malt vinegar. To be honest, wings are not my thing. They are messy and spicy. But people out partying love them, and Dean has given folks an interesting variety. There’s Traditional, Ghostly, Sweet and Sour Chili, Nashville, Blackened Jerk and Summer Jam which has strawberry, jalapeno and red onion jam. We shared some of the Nashville variety, which came smoked then grilled and topped with tangy BBQ and diced pickle. The pickle created a balance to the spice and it was really pretty good even for a boring eater like me. The sliders were just plain amazing. I’ve written before about the chicken sliders and the Reuben sliders. This round of creative slidery has birthed the Chicken Shawarma Slider, the Lamburger, Steak Egg Bacon Slider, Chicken Parts, Lox of Luck, and Bahn MI Sliders. The Chicken Shawarma Slider comes with a house-made garlic sauce that is just amazing. The lamb slider went well with it. Will these unique items make it on to the regular menu after the renovation? That depends on the response by customers this month. So if any of those sound good, try to make it in by Sept. 1. The renovations will happen sometime in the next couple weeks as well, but Bach says they should happen pretty quickly. 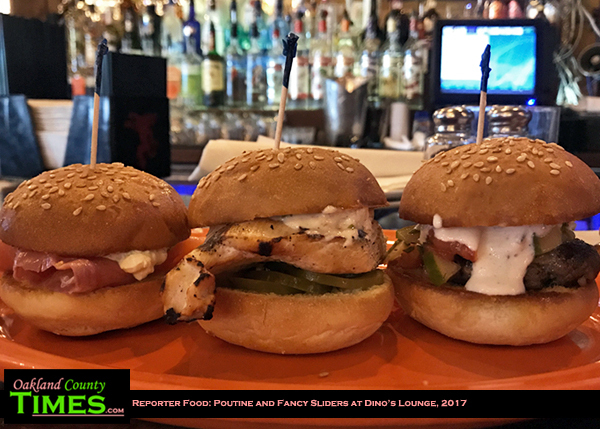 Dino’s Lounge is a longtime advertiser of Oakland County Times. They are located at 22740 Woodward Ave in Downtown Ferndale. 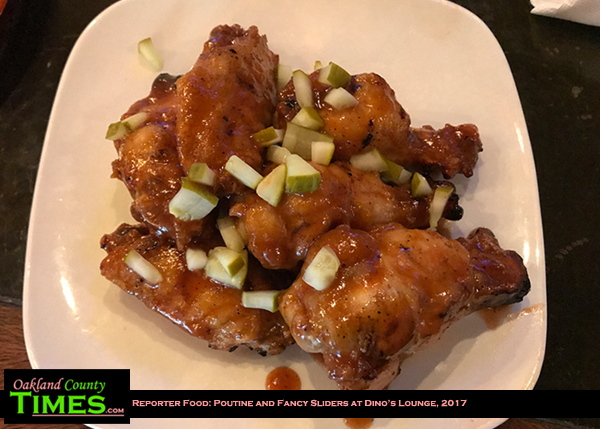 Visit them online at www.dinoslounge.com. For more Reporter Food Columns go to http://oaklandcounty115.com/category/blogs/food-blogs/.